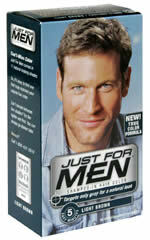 Starting 12/16 Walgreens will have Just for Men or Touch of Gray Hair Color on sale for $6.99. Use this Mail-in-Rebate form to make it FREE. To receive, print out and send the completed mail-in-rebate form, your original cash register receipt dated before 12/31/2012 with purchase price circled and proof of purchase from any Touch Of Gray product, and they will mail your refund (up to $9.50).